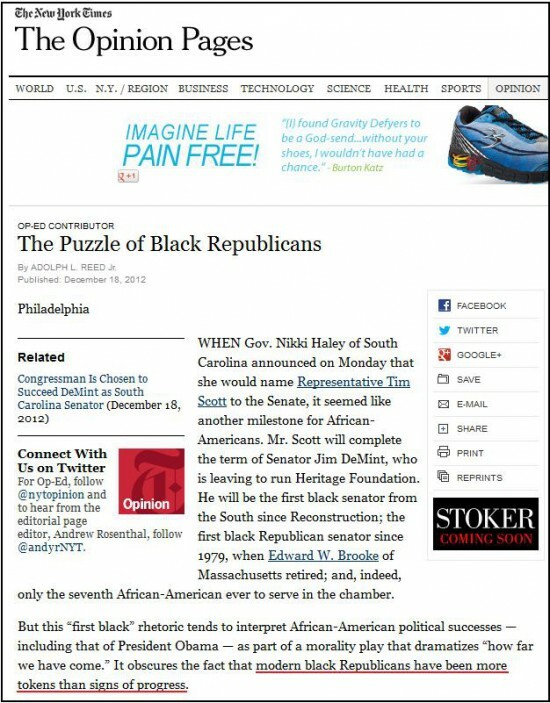 NY Times Welcomes Republican Tim Scott to Senate By Calling Him a "Token"
Republican Tim Scott is the only African American in the US Senate. You have got to hand it to the New York Times’ editors – they’ve got moxy. A Times opinion piece on Tuesday introducing their readers to the newest Senator from the Palmetto State, former Rep. Tim Scott (R-SC), speaks about him – and those with who share his political affiliation and skin color – in the terms you would describe a curious science project. In “The Puzzle of Black Republicans,” the Times summons all the subtlety of the Kool-Aid Man as they smash through the perception that the “paper of record” maintains a single shred of neutrality as they advance the notion that non-Democratic African-Americans are a curiosity to be examined like some newly discovered species of fish. Of course, it’s OK for liberals to call blacks “tokens” as long as they are Republicans.